Mitchell’s brigade charges up Horseshoe Ridge and drives off Fulton’s brigade. 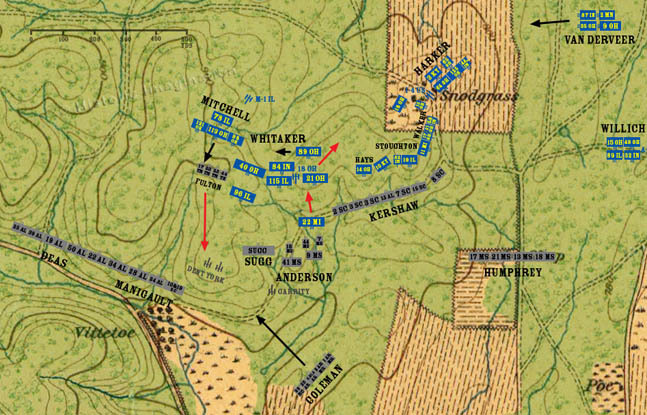 Anderson’s Brigade halts it retreat and fires several volleys into the 22nd Michigan. The 22nd suffers heavy casualties and retreats back up the slopes of Hill Three. The 18th Ohio Battery gains the crest of the ridge, begins taking casualties, and routs. It limbers and flees back the way it came. The 89th Ohio must quickly sidestep to the right to avoid any injuries from the stampeding battery. Deas and Manigault finish their alignment. Both brigades face deep, narrow draws that will hinder any forward movement. Coleman’s brigade reaches the slopes of Horseshoe Ridge.